Spring hasn't quite sprung yet (not surprising given all the surprise snow) but that hasn't put a damper on us! We've somehow managed to keep up with all of the new work and clients that kick started our year and there's no sign of slowing down! February was a nice focused month that may not have been the busiest for events here at ODI Leeds but was certainly busy in the background. Lots of new partnerships and collaborations were forged that would be the basis for future work and events (see below) and we completed the first series of casual sessions for the Ofcom innovation work. After the announcement of a new Geospatial Commission in the UK, we worked closely with ODI headquarters to quickly put on a geospatial user needs workshop, which was very popular and helped compile a comprehensive set of requirements from the geospatial community to feed back to the UK government. The foundation of good work is good people to work with so we couldn't be happier to announce that not only have Jaywing Intelligence (formerly Bloom) Leeds City Council, Bradford Council, and ARUP renewed their sponsorships but we also have THREE brand new sponsors! We hope you'll give Yorkshire Water, AQL, and NHS Digital a warm welcome. March started deceptively quiet with lots of projects bubbling away in the background and innovation events to plan for. On March 15, we held the innovation day for Ofcom data - a gathering of the data community and Ofcom folk who all wanted to see how Ofcom data was currently being used and how it could be used in the future. There was an overwhelming optimism for Ofcom data and the good that could be done with it, with the use of coverage data to map 'not-spots' by the RAC Foundation as a shining example. It was a productive day - people could explore Ofcom data and feel confident that they could be approached with innovative ideas. By the end of the day, Ofcom had made several good connections with attendees and were ready to keep conversations going. All of the notes, photos, and slides can be found on this hub-page. Having only joined us as a sponsor in February, Yorkshire Water were keen to get the ball rolling on their open data innovation work. In a press release, Yorkshire Water stated their intentions and commitment to an 'open by default' approach with a view to engage more widely with the public and with their customers. The innovation work in 2018 will take the form of a series of small events followed by a 2-day hackathon titled #WaterData18. The first of the small events was a soft launch for #WaterData18 - a casual morning for people to find out more about Yorkshire Water's goals and how to get involved. Richard Emmott, Director of Communications at Yorkshire Water, outlined their goals for open data while Rob Krempic, Manager of Asset Analytics, talked about an ideal future that could see real-time asset analysis. Underpinning all of the discussion was Yorkshire Water's commitment to working harder and better for the customer. They want to better understand water usage so they can provide a better service and prepare for unusual circumstances, such as the recent adverse weather. They are looking for collaborations from a variety of sources to build a clearer picture of their own network and they're doing it in the open for all to see. 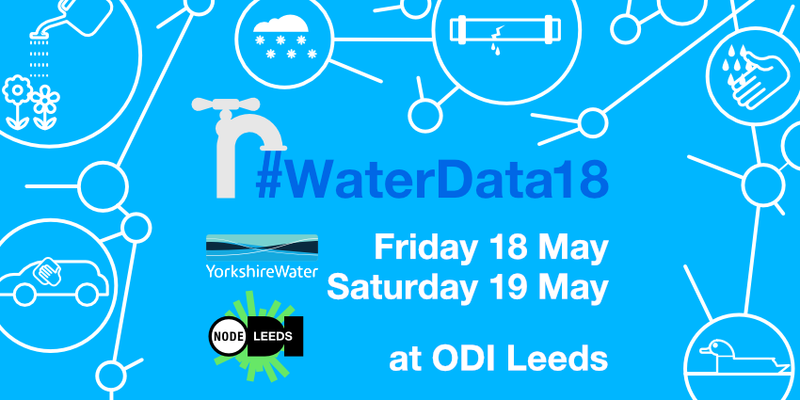 If you want to stay informed about the work with Yorkshire Water, keep your eyes on the #WaterData18 hub-page for updates, resources, datasets, and more. In between our innovation events, our bright and beautiful space was kept buzzing with plenty of other events. On 14 March, we hosted Local Trust and their big northern meeting, and on 16 March we made Socitm comfortable for their away day. On 20 March, ARUP and UKAutoDrive held an informative evening event about the future of autonomous cars. And in the very last days of March, we were home to Unilever on the 28th and University of Leeds on the 29th. Without using too many Spring metaphors, it is a season known for new beginnings and fresh opportunities - and you don't get any fresher than a new job! We have a vacancy for an Innovation Consultant to help with various aspects of the innovation work we do at ODI Leeds. You must be comfortable with an 'open approach' and ready to help with other elements of project work, such as research, writing blog posts and reports, documenting, liaising with clients, etc. You will also have to work closely with other members of the ODI Leeds team to cover things like social media and general upkeep of the space. The deadline for applications is 17 April. Squeezing in just before the Easter break, delegates from ODI Leeds and Jaywing Intelligence went to London as part of the IoTUK Nation 'on Tour' exhibition, with a particular focus on the graph database element of the project. This was made into a VR experience, where attendees could explore the database in a virtual environment. For more photos and comments from the tour, check out Jaywing Intelligence's twitter stream. As you may have noticed, we are doing a lot of promotion around our Leeds Digital Festival events. There's a lot to be excited about - the Showcase, a fabulous party, a transport special, an IoT day and much more - but we'll be sending out more info about these events in the coming weeks. In the meantime, you can check out our headline events or have a gander at the whole schedule, which includes events organised by LIDA, Leeds City Council, Hippo Digital, Jaywing Intelligence and more.